The Horizon View Portal page for the connection server has changed throughout the different versions. This article describes how to modify the behavior of the portal for version 5.3. 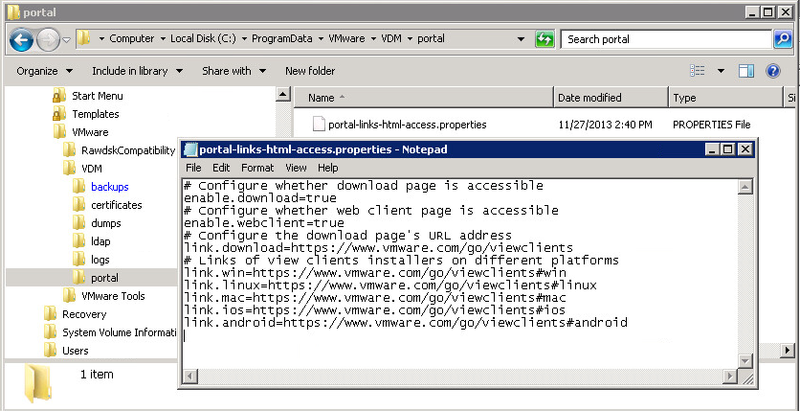 How to modify the HTML Access enabled portal with Horizon View 5.2 is described in another article. The portal described here is only available when you have installed the HTML Access feature. When you don't have that additional feature installed then you have the 'default' portal. 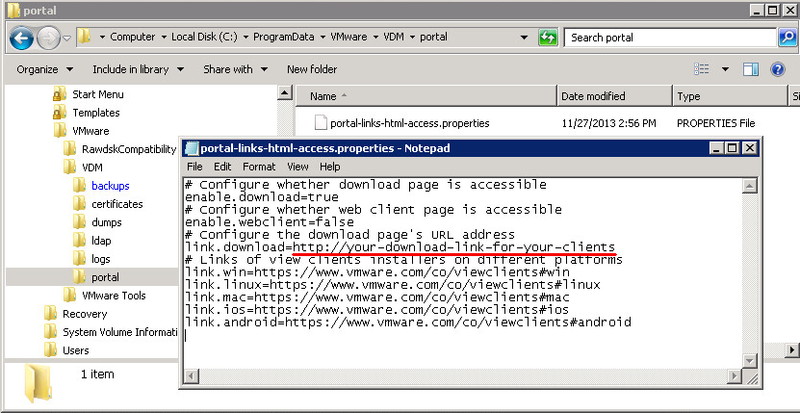 How to modify the text and download links for the regular portal is described in this VMware-document: Using VMware Horizon View Client for Windows. When you connect to your Connection Server or Security Server the portal normally looks like this: (The HTML-part is available only if you have installed the HTML-access component). 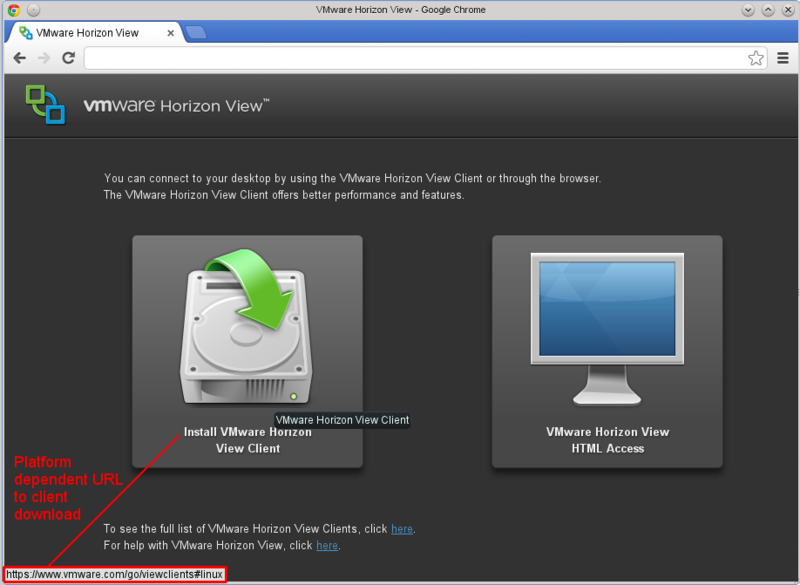 Different from version 5.2 this page now has platform dependent download links for the Horizon View Client in version 5.3. The default links all point to the same web page, but you can modify the link for each OS your clients are using. Note: If you access your portal through a Security Server then you still need to modify these settings on the Connection Server. The Security Server does not have it's own portal files. In the following image you see can see the default contents of the file. After making changes to this file you must restart the VMware View Web Component-Windows-service. If your portal does not respond immediately after restarting then give it a minute to reinitialize. If you set both values to false then the portal will become unaccessible. You can also set one of the two values to false. If you set enable.download=false then when accessing the portal web page clients are immediately redirected to the HTML Access login page. If you set enable.webclient=false and configure a custom link to your own web page then clients connection to your portal will be redirected to that URL. A last note on all of this: if you upgrade to a new version of Horizon View there is a fair chance that this will be overwritten. Or it could move to another location like it did from version 5.2 to version 5.3. So make sure to create a backup of these modified files and check what happens during the upgrade before you upgrade your production environment.